The Association for Computing Machinery (ACM) awarded computer chip visionaries John Hennessy and David Patterson the 2017 A.M. Turing Award, a $1 million prize considered the equivalent of the Nobel Prize for computer science. The pair’s bold innovations in the industry earned them the prestigious award named after Alan Turing, a British researcher, known for cracking German enigma codes during World War II and affecting what computer science is today. Hennessy, a Stanford graduate, and Patterson, a Berkeley graduate, are both San Francisco Bay Area professors who work with top technology company Google, Inc. Together, they have revolutionized processors using reduced instruction set computing (RISC) technology. 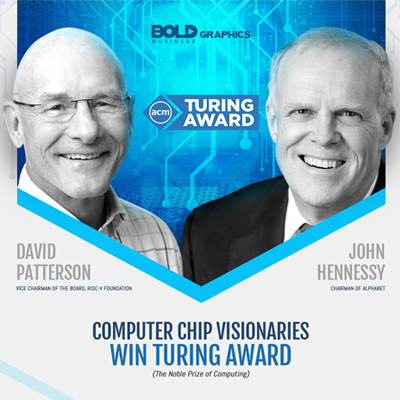 Hennessy and Patterson received the prestigious Turing award for their contributions to the industry. Their RISC tech helped fuel the growth of what today are big names such as Sun Microsystems and Silicon Graphics, paving the way for today’s major smartphone industry. Over the course of about 30 years, the pair’s bold moves have changed the direction of technology, while at the same time embodying the Silicon Valley ethos of always innovating, trying new things, and essentially throwing out the old or outdated way of approaching solutions. 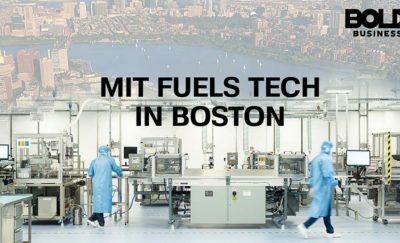 Together, the pair is also currently working on other astounding pieces of technology, such as the special-purpose chips for Google’s Tensor Processing Unit which helps improve and speed up artificial intelligence (AI). As with many other risky moves, the industry did not exactly welcome Hennessy and Patterson’s bold idea with open arms. “The initial reception was, ‘These two academics are crazy, they don’t know what they’re talking about, this technology will never work in the real world,’” Hennessy recalled. Much to peoples’ surprise, RISC worked. Linley Gwennap, a Linley Group analyst, said that “RISC did win the day from a technology standpoint” after plenty of debate. Eventually, Hennessy’s startup MIPS helped catapult his ideas and winning the hearts of Silicon Graphics, while Patterson’s Berkeley team created what is now Sun Microsystems’s SPARC processor. Their joint efforts also helped affirm Silicon Valley’s place by shifting the computing industry from East Coast bigwigs like IBM and Digital Equipment Corp. to them – Silicon Valley has established the Bay Area as a technology company mecca. One of the major reasons people doubted what Hennessy and Patterson had to offer is because their approach was different. It seemed like a counterintuitive idea, even to experts. Stemming from an idea by Hennessy dating as far back as 1980, he published an academic paper in October 2017 stating that silicon chips kept becoming more complex as time passes, but that machines may become more powerful if simpler computer chips were used. Today, over 99 percent of all new chips take advantage of the pair’s RISC architecture, based on data released by the ACM. Patterson and Hennessy’s idea of using simpler chips is making waves in the industry. Their argument that simpler chips not only ran faster, but also consumed less power, makes chip designers’ lives much simpler and easier as well. As such, the RISC architecture’s bold impacts resonate beyond what consumers experience, eventually becoming the standard for almost all computer servers and workstations that previously held back even the biggest companies and corporations around the world. “This is the one fundamental idea that has been sustained over the last several decades of chip design,” said Dave Ditzel. A chip industry veteran, Ditzel also studied with Patterson at Berkeley, and is now in the process of building Esperanto, a RISC chip startup. “I expect this to play a vital role in the future,” said Patterson. “And the architecture is not that different from what John and I described back in 1980.” Ditzel concurs, saying people need to start approaching design differently. “Complexity is even more of an enemy than it was before,” Ditzel said. With Patterson and Hennessy spearheading this vital change to what technology we have today, the distinguished Google engineers are positively affecting the entire industry. Bill Gates, Microsoft founder, recently commended their work as well. Their contributions “have proven to be fundamental to the very foundation upon which an entire industry flourished,” he affirmed.